Please note that the content of this book primarily consists of articles available from Wikipedia or other free sources online. Arts Administration is the business end of an arts organization responsible for facilitating the day-to-day operation of the organization and fulfilling its mission. An arts organization includes professional for-profit and many smaller professional and nonprofessional 501 not for profit, arts related businesses. 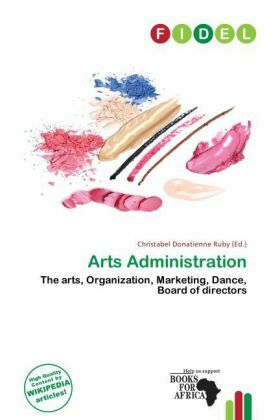 The general duties of an arts administrator can include staff management, marketing, managing budgets, public relations, fundraising, program development and evaluation and board relations.